STREET PHOTOGRAPHY HAS LARGELY BUILT ITS TRADITIONS on the truths and tales of the human face. The art of illustrating urban narratives on the fly relies chiefly on how those stories register on those faces. It’s a visual drama that no shooter can resist. But the story of how, for good or ill, modern cities affect people….the way they process, channel, contain or empower them as moving props……that kind of story can be told without clear or readable facial features. This doesn’t mean that “humanity” doesn’t matter in these pictures: it means that some images are designed to show how it’s impacted that humanity en masse rather than one person at a time. There is one other singular thing that happens when a photograph renders a face as a blank canvas. It means that, for the interpretive viewer, that face can now contain whatever he/she wants it to. In such pictures, both photographer and audience are in a kind of coded conversation about what the image “says”. 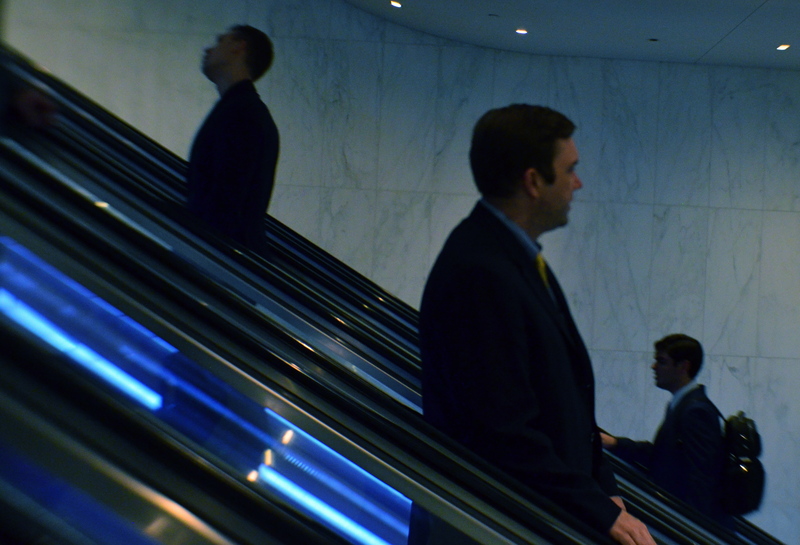 To illustrate this point: the above photo may or may not be about anything more dramatic than three men in the act of riding an escalator, headed for lunch/a meeting/the parking lot. However, since their features are shrouded in shadow and presented in a softer focus, I can intend a message of my own devise, and outside eyes can supply subplots that either complement or derail that narrative. That’s the kind of chat that keeps an art throbbing along. It allows everybody on either side of a photograph a chance to paint portraits based on their own eye. This entry was posted on November 7, 2018 by Michael Perkins. It was filed under Conception, Interpretation, Street Photography, Urban and was tagged with Candids, Unposed.